The entry list for the 2019 Pikes Peak International Hill Climb is exciting and all but what’s really titillating us is the inclusion of record-setter Carlin Dunne entered mysteriously into the exhibition class with an unnamed Ducati motorcycle. What could it be? Well, we have Ducati Streetfighter on our minds especially after that epic roadtrip we undertook on the machine in The Great Italian Roadtrip. And the thought that how good a Panigale V4 Streetfighter might look. Sadly enough, it was discontinued. But with this turn of events, we are speculating that the ‘mysterious’ machine could be a naked streetfighter version of the Panigale V4 which we think shall be called the Ducati Streetfighter V4. If that doesn’t sound exciting, we don’t know what would. Another ‘expectation’ of ours is that we might get to see it at EICMA later this year. But then, there is still some time for that to happen (if it does) and what do we do till then. Well, we can drool over this example of a naked Panigale V4 courtesy Officine GP Design. They call it the V4 Penta and by making this motorcycle, the Italian outfit has created what a lot of folks have been waiting for; a stripped down version of Ducati’s Panigale V4. We believe that it might have been a heck of a task to do so too considering that the Panigale V4, all shrouded in red fairings, must not have been an easy motorcycle to turn into a naked Streetfighter. It simply does not seem conducive to it. But that didn’t stop Officine GP Design from making one. 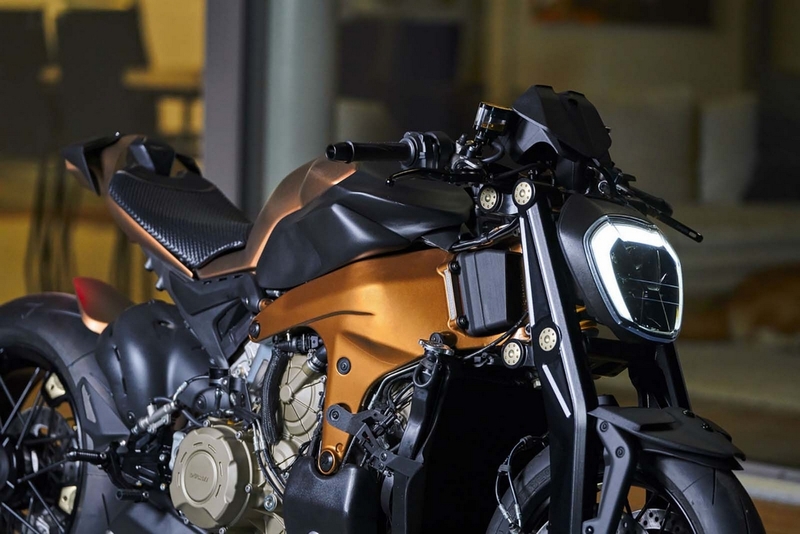 Panting the aluminum front frame to match the frame seems like a strong move by Officine GP Design, and the headlight from the Ducati XDiavel looks the part, and helps keep things in the family. Officine GP Design’s use of a girder front end is an interesting choice, as are the burly wire-spoked wheels they have chosen as well. And with the engine likely to the Staradale V4 that powers the Panigale V4, it might very well deliver close to 200 Bhp which is breathtaking to say the least. But considering the facts mentioned above, it will be interesting to see how Ducati packages a Streetfighter model of the Panigale V4. On the mechanical front, we expect to see the production Streetfighter to have a fine tuned engine to favor street riding with bringing down the torque curve down the rev range. The competition, Aprilia and KTM to say the least and considering that, the power will surely be in excess of 180 Bhp if not on the extreme end like the MV Agusta Brutale 1000 Serie Oro. All speculations aside, we still have quite some time even if we consider that such a model is feasible. 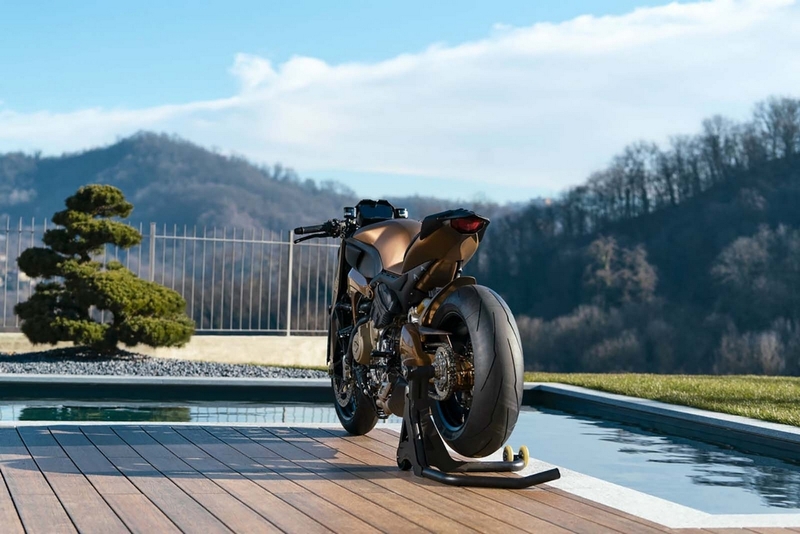 And till then, we have this fantastic V4 Penta from Officine GP Design to drool over and also, the photo shoot reminds us of our Home is Where the Bike is concept. Last edited by NewsReaper; 01-31-2019 at 02:12 PM. That is INDEED what sweet dreams are made out of! Dont like that front headlight from the diavel. Nice to see Ducati getting on-board with the non-telescoping-fork front suspension trend. Needs to happen more. There's no reason to continue trying to overcome all the inherent flaws in the telescoping design anymore; BMW has long proved the validity of alternate suspension, plus you have at least two small builders (Vyrus and Confederate) carrying the torch, and Yamaha opened the door with the GTS1000 and the RADD suspension. ATGATT: All The Gear, All The Time! Put the phone away, put your helmet on, and ride! Scooters are like fat girls: fun to ride, but embarrassing if your friends see you with one. Wonder why then BMW goes for the telescopic design for their flagship offering(assuming the flagship is S1000RR and not the GS). Is it that it's lightweight? They could have just used their in house design rather than slapping an ohlins or showa USD their? Btw the picture above is not an official Ducati. It's "example of a naked Panigale V4 courtesy Officine GP Design." The hero always RIDES into the sunset!